Preview of Last Night’s Wedding at the Drake — Sweetchic Events, Inc. I finally remembered to take my camera with me to a wedding! I almost hate to spoil my eventual post with the pro-pictures by showing my own shoddy images… but I can’t resist! Cocktail hour was in the stunning Palm Court. This was a huge upgrade that the hotel threw in at the last minute. Apparently this room alone rents for $6,500, eeks! My bride and groom were breathless when they entered… for good reason, no? Their coral, gold and white color scheme was perfect in the Gold Coast Ballroom. 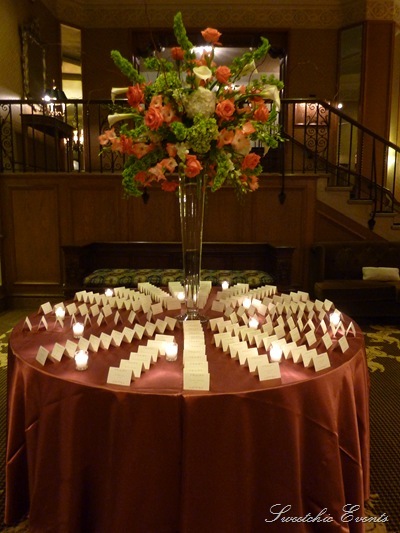 Amazing florals by Richard Remiard Event Design. I’m rather excited that I finally have the next few weekends off before the next slew of weddings!